I have been greatly burdened lately, to the point that I can’t think about much else beside this topic. I don’t know why, precisely, that it is so urgent, but I know that it is. I have to admit that this journey began with some rather base motives. I turned on the History Channel to watch a show called “Ancient Aliens,” with the express view of laughing at them. I am not a proponent of the view that aliens landed on Earth and influenced the course of our history. However, as I watched the evidence that they presented of verifiable and remarkable sites and artifacts from around the world, what I was seeing began to fit together with all that I had been learning in previous years to form a complete and seamless narrative of history that is not taught anywhere else, to my knowledge. It has taken me almost forty years to reach this point and I thought that I would share some of it with anyone who is interested. I know we are very few and far between. This TV show presented verifiable, concrete facts about obviously artificial objects that are currently unexplainable. The narrators say these are all due to aliens who came down and either made these things themselves or showed the humans how to do them. The problem lay with the basic viewpoint of Darwinian, materialistic uniformitarianism, as Douglas Kenyon calls it. The presenters on the show were hampered by a "knowledge filter" (Kenyon again) that told them that human beings, the world and all the physical processes within it had always been the same as they are today. In their minds, human beings today cannot do some of the things that were obviously done. Therefore, human beings in ancient times could not do these things either. Christians know that a cursory reading of the book of Genesis in the Bible would have told you such was not the case. In addition, though, there is an enormous and growing amount of material, physical evidence, that also tells us exactly the same thing. There was no need to invoke aliens as a cause. Human beings would have been more than sufficient to the task. By the way, this blog is aimed at Christian believers. If you are not one, I hope that you have the intellectual intestinal fortitude to look at the evidence honestly and judge it for yourself, without either depending on the opinions of others or using some sort of personal prejudice to prejudge and dismiss it. I am not writing this blog to present evidence, per se. I will, rather, refer to the evidence that has been gathered and documented so well from so many different places by talented researchers and teachers. I will, where I can, provide links or references so that you can research this information for yourself. I DO NOT want you to believe me! I want you to be a total skeptic and research these things out for yourself. There is more material out there that speaks to this question than I can possibly include here. Look it up for yourself! Be honest researchers, like the Bereans in the Book of Acts. Ecclesiastes 1:9 "What has been will be again, what has been done will be done again; there is nothing new under the sun." To digress a little, I had been spending a lot of time studying about angels, with the idea of getting to understand the world behind the world, the spiritual world that is producing the effects that we see in the physical world. With that in mind, it would be wise to remember the axiom which says that the surest way to predict future behavior is to study past behavior. I think we will see that this axiom applies to our present issue - to humans and non-humans alike. So, let’s predict some future behavior by looking at some past behavior. I am going to review some evidence with you. This subject involves both creation science and prophecy and I think that both of these things are going to help us in our discussion. We will be lightly skimming over a great number of very deep and complicated subjects. Consider this introduction an overview designed to whet your appetite. My intention is to look at many of these topics in far greater detail as time goes on. Again, I want you to go on-line and research this for yourselves! There are some wonderful maps and photos and drawings there. This is too important! Don’t just believe me! To start us off, let’s describe the world as it existed in the beginning of mankind’s history. This reconstruction can mainly be traced to the work of Robert Baugh, Ph.D. (http://75.125.60.6/~creatio1/index.php?option=com_content&task=view&id=74&Itemid=29) and Walt Brown, Ph.D (http://www.creationscience.com/onlinebook/). In an effort to be both ethical and concise, I will note the concepts belonging to each with an (RB) for Dr. Baugh and (WB) for Dr. Brown. There is some overlap between the two men's work, understandably, and this will be noted with (RB & WB). 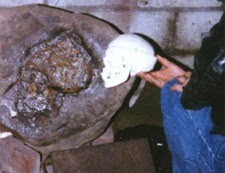 and fossilized human skull twice the size. twice as large, preserved in stone. 1. Larger and stronger The evidence seems to show that the people of that time averaged 8-11 feet tall, with robust musculature. Arnold Schwarzenegger would have been no big deal to these people. 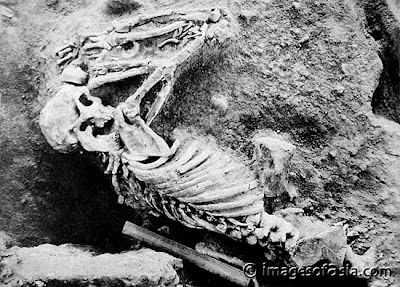 The women were as robust as the men, to the point that it is sometimes difficult for scientists to differentiate the bodies that they find from the bones alone. 2. More intelligent A human infant today begins life with twice the number of brain cells that an adult has, but these are gradually lost as the child grows, due to lack of oxygen. Earliest mankind did not have this problem. Twice the number of brain cells would undoubtedly produce superior mental abilities, in ways that we probably can’t imagine. Our current I.Q. tests would probably not even be capable of measuring these people’s intellect. Thinking would be faster and clearer and more creative. Memory would be virtually eidetic (photographic). There is evidence that their sight, hearing and other senses would be far superior to our own. 3. Better health and longer life Scripture tells us that the first people had lifespans that were greater than ours by a factor of ten. This is also borne out by skeletal remains. More nutritious food combined with the greater oxygen levels would have produced healing that was almost instantaneous. This has been proven experimentally. A deep cut would have healed completely overnight. ﻿﻿4. Unified language. Archaeologists have discovered a unified alphabet on all five continents. 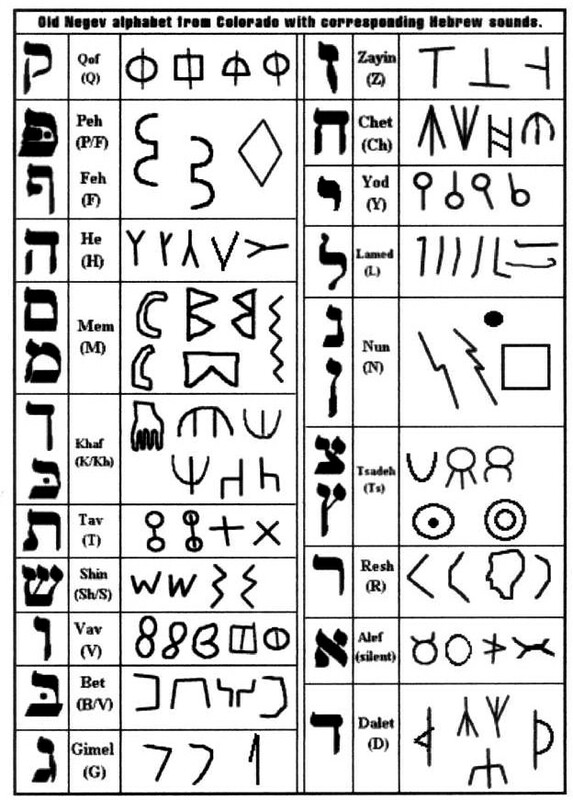 It appears to be the precursor of several of the very oldest of languages (proto-Hebrew, Sabean, proto-Canaanite) and is translatable. Thus, we have been able to understand that these people had common thoughts about history, religion, ethics, etc. 5. Spending almost no time "making a living." Because the food plants grew so fast and so well, there was no need to spend a great deal of time and effort gathering food. Fruits and vegetables were more than sufficient, so there was no need for hunting or caring for livestock. “5000 year old alphabet has been found on six global continents. Translations and grammar suggest a global human culture thrived in antiquity." “The author, in attempting to document some unusual and very old rock art in remote North America, has discovered an ancient alphabet. 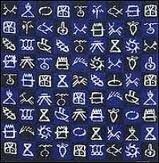 This alphabet is similar to ancient writing found in other locations around the globe and the author suggests that this is the result of a cultural migration. “The alphabet has most recently surfaced in Yemen, where it was carved in a font style associated with the Sabatean Empire under the Queen of Sheba. 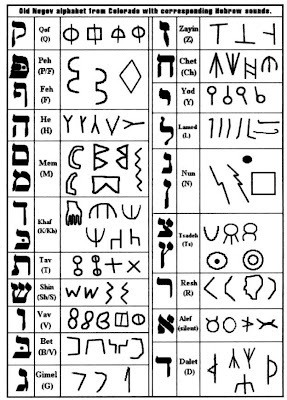 The alphabet is now understood to be proto-Himyaritic, or Sabaean, and translated using a proto-Canaanite dialect. 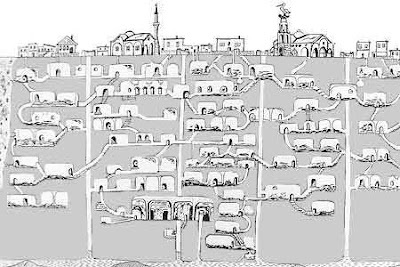 “The author recognizes the danger of describing the language as "old Negev" or "old Hebrew," despite the fact that root-Semitic languages are used in the translations. Evidence of the antiquity of this script in both America and Australia suggest that this root language may pre-date that of the Hebrews by at least a millennia. “The author and his associates suggest using an unbiased name, such as "the First Tongue," to avoid any biased association with a specific people or era. “The scientific journals Nature (London,1886) and L'Astronomie (Paris,1887) published confirmation that in 1886, in the foundry of the Austrian Isador Braun of Vocklabruck, a block of coal dating from the Tertiary period was broken open. “A small metal cube was discovered inside. Tests indicated that the cube was composed of a steel-nickel alloy. It measured 2.64 by 2.64 by 1.85 inches, weighed 1.73 pounds, and had a specific gravity of 7.75. “In 1820, the brilliant Orientalist Claudius J. Rich became the first person in modern times to survey Nineveh. 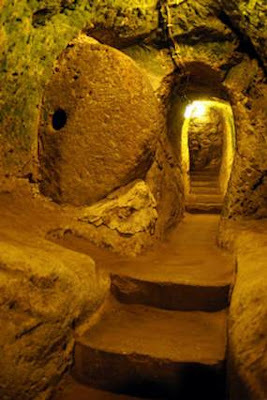 It was later excavated by French archaeologists and in 1846 and 1847 by the distinguished English archaeologist Henry Layard, who discovered the palace of Sennacherib. “Layard took back to England an unrivaled collection of stone bas-reliefs, several bronzes and thousands of clay tablets inscribed in cuneiform script. But it was while working at Nimrud, the earlier capital of Assyria, that Layard made his most intriguing find - a curious crystal artifact. “It was a disc, not quite circular since it had 0.2 inches discrepancy between its longer and shorter diameters. One face of the disc was flat, but the other had been ground to make it convex, using some sort of precision tool. Although no longer in pristine condition, it showed the remains of twelve cavities which had once contained condensed gases or liquids. At first, archaeologists concluded the disc must be an ornament of some sort, but then David Brewster became interested in the find. “Brewster was an eminent Scottish physicist noted for his experimental work in optics and polarized light. Today he is best remembered as the inventor of the kaleidoscope and the man who first produced three-dimensional images using a modified stereoscope. 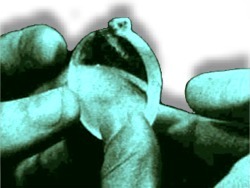 Subsequent digs have produced a total of 450 such lenses. 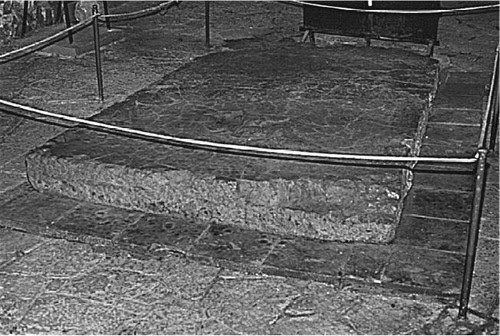 “But then so does the ancient 8.8-ton slab (a ton is about the weight of a car) of man made-glass discovered in 1956 at Beth She'arim, south-west of Galilee. 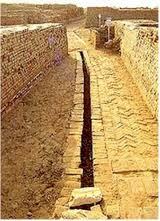 “There are 170,000 miles of underground aqueducts (water pipes), thousands of years old, in Iran. “The tomb of the Chinese general Chow Chu (A.D. 265-316) presents a mystery. When analyzed by the spectroscope, a metal girdle showed 10 percent copper, 5 percent manganese, and 85 percent aluminum. But according to the history of science aluminum was obtained for the first time by Oersted in 1825 by a chemical method. “To satisfy industrial demands, electrolysis was later introduced into the manufacturing process. Needless to say, an ornament made of aluminum, whether chemically or electrolytically, seems out of place in a third-century grave in China. Keeping all this in mind, what is our Enemy’s primary goal? The problem he has is that he can’t. He can’t dominate the earth himself directly. He was not given dominion over the earth. That was given to man. The only way that he can control anything on earth is to deceive men and women into giving it to him. When we read about the Tribulation in the Book of Revelation, we see that he needs the anti-Christ, a human, to carry out his plans here on the earth. He can’t do it himself. I believe that his leadership of the rebellion that we see in Revelation is going to be the second and third time that he tries this. He’s done all of this before. We just don’t have a written record of all the evil that he carried out in the dim reaches of the beginning of time. Ge 6:2 the sons of God saw that the daughters of men were beautiful, and they married any of them they chose. Ge 6:4 The Nephilim were on the earth in those days—and also afterward—when the sons of God went to the daughters of men and had children by them. They were the heroes of old, men of renown. Ge 6:5 The Lord saw how great man’s wickedness on the earth had become, and that every inclination of the thoughts of his heart was only evil all the time. I believe that Satan used the Nephilim as his leaders, his commanders, to rally and organize his followers. Let’s keep verse 5 in mind. What would Satan have been up to in that kind of environment, using people with the capabilities that we have discussed? There is massive evidence of Antediluvian (pre-flood) mankind’s superior abilities, some remaining in existence even after the flood. Let’s look at just some. We all know about the Pyramids in Egypt. They are composed of blocks anywhere from 2 to 65 tons (remember, a ton is the weight of a standard family car). There are 2.5 million of them in Great Pyramid alone. Keep in mind that modern construction equipment generally handles weights of about 5 tons and under. These blocks in the Great Pyramid have been stacked and arranged with almost perfect accuracy to be aligned to the magnetic poles. 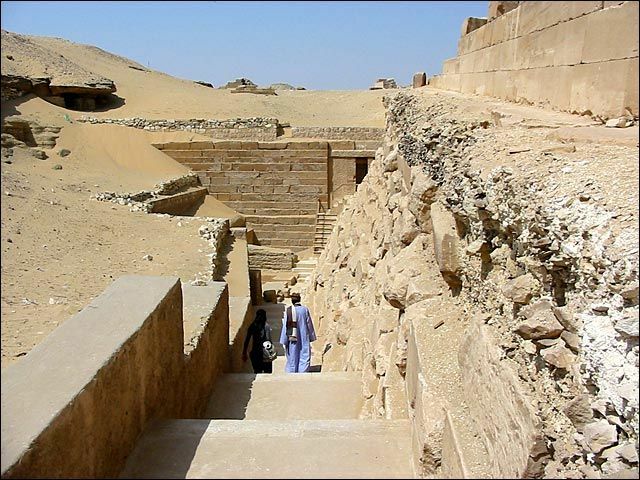 There are also what are called the “Valley Temples” between the Pyramids. Within those structures are blocks weighing 100 to 200 tons. 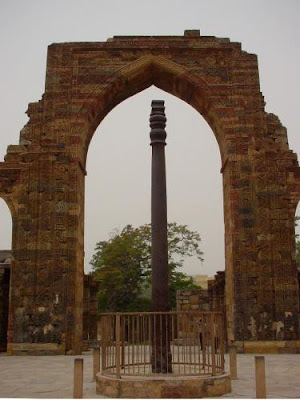 They are being used as lintels – that is, the top beam of the doorways or gates. The evidence seems to indicate that the Valley Temples, the Pyramids and the Sphinx are all pre-Egyptian. That is, they were there before the people that we call the Egyptians, the people of the Pharaohs and King Tut, came on the scene - and we have records of the Egyptians for over 5,000 years, at least. Baalbek, Lebanon. Notice the people standing beside and on the stones. 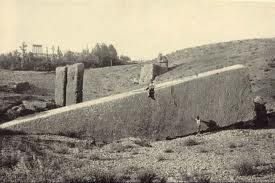 At the Temple of Jupiter in Baalbek, Lebanon, there are 1,000 to 1,200 ton stones in the foundation. They are the size of railway cars. 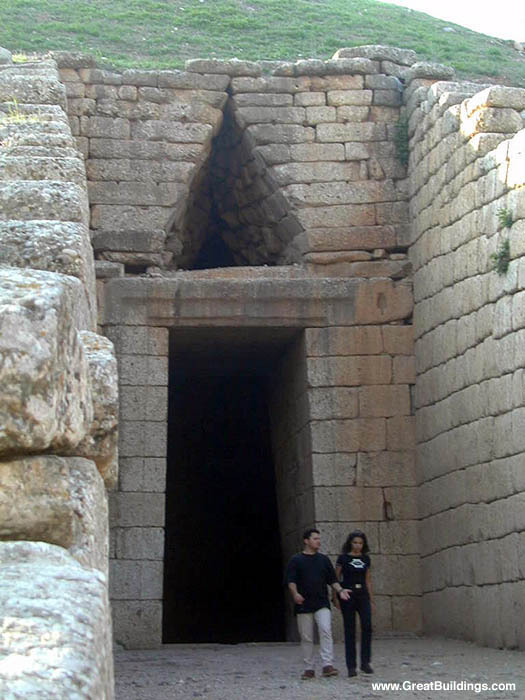 At Mycenae, Greece, in a structure called the Treasury of Atreus, there is one stone over the main doorway that weighs over 1,000 tons. Christopher Dunn, an accomplished machinist and engineer, has spent decades researching ancient tools and how they were used to produce stonework in Egypt. 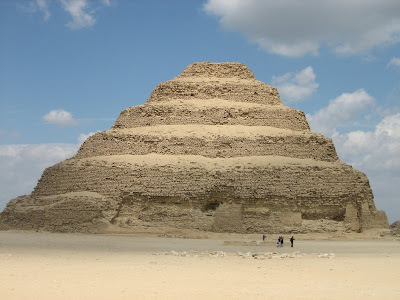 His problem is that, while there is plenty of unbelievably precise stone work in evidence everywhere in Egypt, there are no evidences of the kinds of tools that we would use - no cranes, no diamond edged saws, no diamond pointed drills. He cites 11 foot long granite sarcophagi which have smooth sides, top and bottom, inside and out, with all the surfaces level to 1/2000th of an inch, consistently, over every surface. 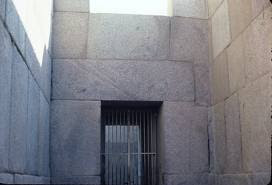 This is beyond what modern stone working technology can do without an unbelievable expenditure of time and effort. He documents this very fully in his books and his website, www.gizapower.com. Curiously, when Mr. Dunn presents his findings to machinists, stone workers, construction experts and engineers (people who actually do this kind of work and know what is involved), he receives an enthusiastic endorsement. When he presents it to archaeologists (people who have, for the most part, done little if any physical labor, much less stone work), he is dismissed, because his findings don't support their theories. 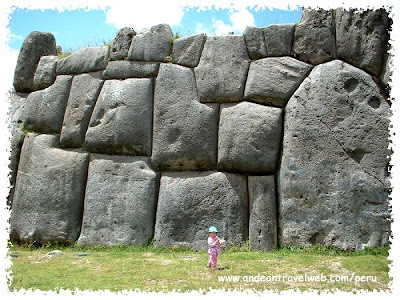 The Incan fortress of Sacsayhuaman. Sacsayhuaman again. Notice the adult standing on top. 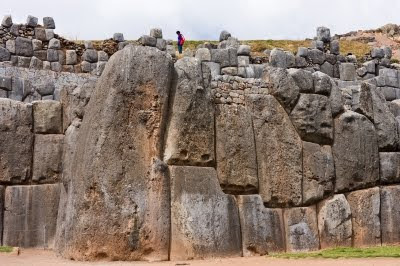 The ancient Inca Indians of Peru are renowned for their stonework. The Spanish conquistadors destroyed much of their buildings and cities. However, in many places, they used the foundations of the ancient Inca buildings and build their own modern structures on top. 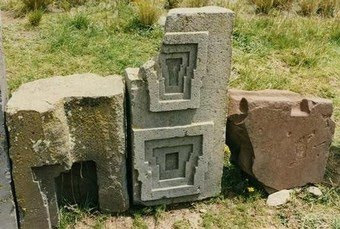 The Incan stonework is jointed so precisely that you cannot place a razor between stones anywhere. 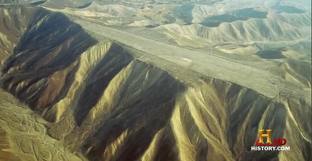 Since the country of Peru is part of the infamous Ring of Fire, (the circle of volcanic activity that rings the entire Pacific basin) the entire area is routinely wracked with earthquakes. The Spanish buildings and even the more modern edifices are cracked and shattered by those earthquakes. The Incan foundations, however, are completely unaffected. 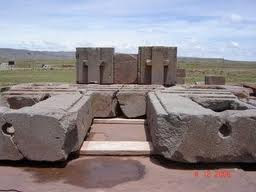 Puma Punku is a site in Bolivia, near the legendary Tiahuanaco and Lake Titicaca. Some scientists say that the people who lived there existed in 2,000 B. C. Since all we have are the stone artifacts that they left and it is nearly impossible to date stonework, this is a dubious time frame, at best. The interesting things about this site, though, are the hundreds of enormous blocks of granite that are strewn about the plain as a child would cast dominoes about a table. 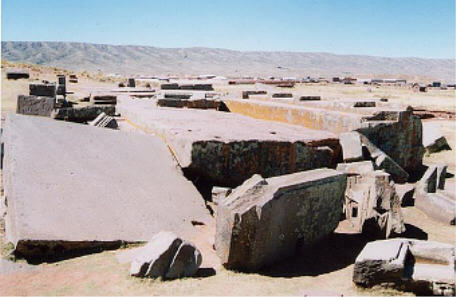 These enormous stones are carved in intricate and interlocking shapes, which fit together like the pieces of a puzzle and scientist believe they formed some sort of building complex. 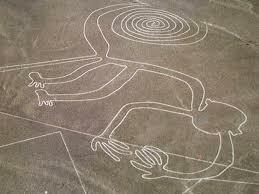 They are decorated with intricate and complex geometric shapes carved into the stone. The carving shows a craftsmanship and skill that even modern stone workers could not equal. The designs demonstrate math concepts we don’t have. Once again, let's stop and consider, where are the tools or machines that were used to accomplish all this? 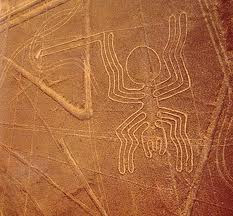 The uniformitarian, Darwinian scientists tell us that the people who lived at Tiahuanaco did not even have the wheel or writing. How could they have done all this? What could Satan have been up to, with all that human capability available for use? The holes in the rock are dwelling places currently in use. Derinkuyu is a small town in the Cappadocia region of Turkey. The stone in that area is very soft and the local people have been carving homes for themselves out of the rock for thousands of years. 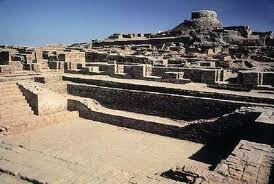 They have also begun to build more modern buildings as well. Recently, while remodeling one of the modern homes, a wall that adjoined the surrounding stone was knocked out and revealed something unbelievable. The complex is 280 feet deep. Since the stone is soft, you would have to be very careful how you constructed it, to make sure that there were adequate supports. Otherwise there would be cave-ins. There is no evidence of any such cave-ins, so the builders must have known what they were doing. There are 15,000 small vent shafts drilled to the surface. 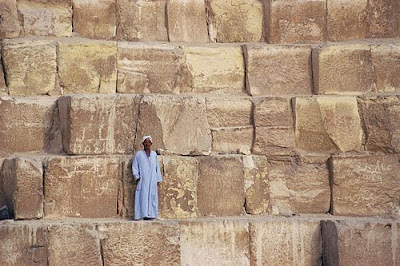 Engineers say that it equals the construction of the Great Pyramids in difficulty. 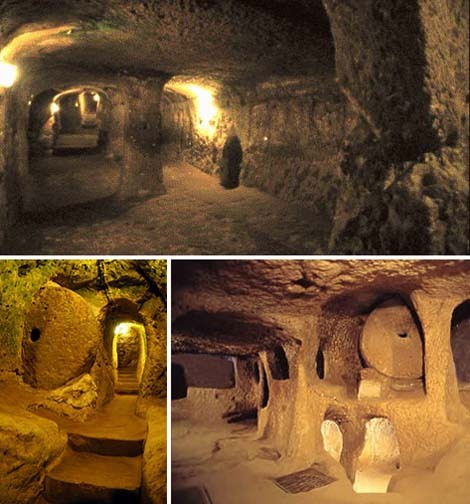 In addition, even if these structures were built by modifying existing caves, enormous amounts of stone had to be removed to make these spaces. None of this waste stone, or tailings, has been located. We're talking about thousands of tons of broken up rock. What did they do with it all? The complex could have held between 20,000 and 30,000 people, over long periods. There are obvious storage rooms, wine presses, worship areas and livestock stalls. Note that, as you can see from the pictures, there is no trace on the ceilings of any smoke or soot that would be produced by torches, candles or oil burning lamps. How were they illuminated? The doors on all the entrances are round discs in slots, on rollers. They are so constructed that one man can close the huge door from the inside, but they cannot be opened from the outside. Obviously, this is a refuge for a whole community from some danger. There are questions, though. 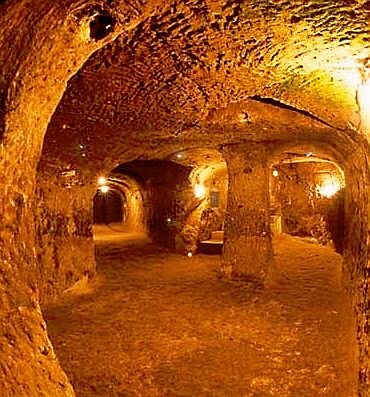 Military engineers say that “a cave is a grave.” Such a refuge would not be effective against conventional ground troops or cavalry. They would only have to search out the location of the cave, plug up the door holes and air holes and allow the occupants to die. It would be, however, effective against someone flying overhead. They would not be able to see the small signs that would indicate an underground community. Why would people thousands of years ago be afraid of being seen from the air? This would all be astonishing enough by itself. 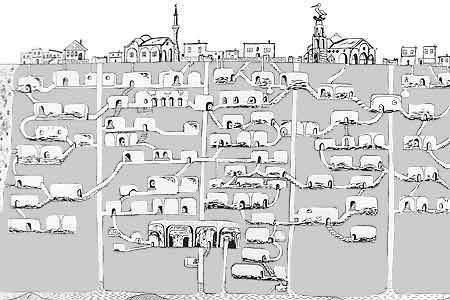 However, there are large shafts that lead from Derinkuyu to other similar underground communities. There have been around two hundred located so far. 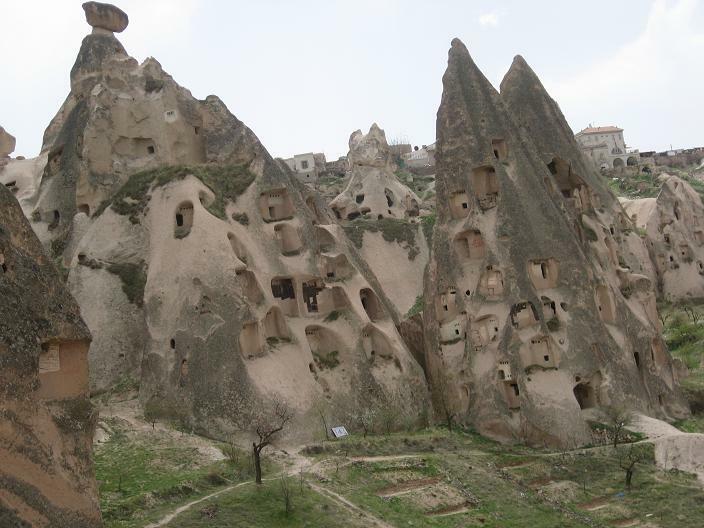 The most recent of these discovered cities is said to dwarf Derinkuyu, as a kitchen would be dwarfed by an entire house. 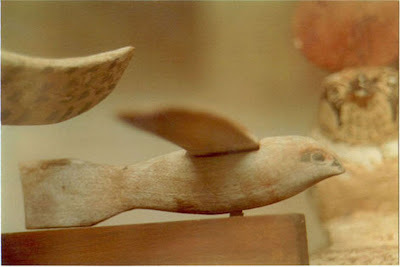 The Saqqara Bird, as it was called, was placed in a museum with a number of other bird carvings. Recently, an Egyptian archaeologist noticed that, though the carving had a bird’s face, the wings had the cross-sectional shape and position of an aircraft’s. Further, the tail was flattened vertically, instead of horizontally, also unlike a bird. There was a socket at the top that could very easily have been the attachment for a rear stabilizer. Using the Saqqara Bird as a model, some aircraft engineers built a larger shape to it’s exact dimensions, attached it to instruments and put it in their wind tunnel. The wings would generate 4 times the lift need to carry the weight of the bird. It is, in effect, a 4,000 year old glider. The addition of some flaps to the wings would allow it to fly as efficiently as any 21st century design. 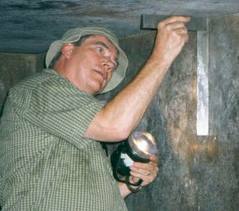 In Columbia, archaeologists have discovered the tombs of the Tolema (or Kalema) Indians. The researchers think that these tombs are 1,500 years old. 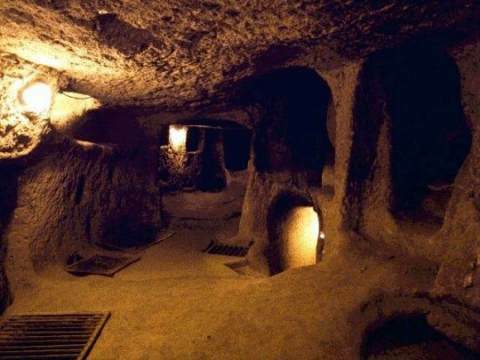 Within these tombs, some of the grave goods include small gold figurines, formed into the shapes of birds, animals, fish, insects or other things. About a dozen of these forms, however, have some odd characteristics. There appear to be triangular, or delta, shaped wings. These wings are attached to the ventral, or belly, surface of the object, unlike any flying creature of which we are aware. All flying creatures have the wings attached to the dorsal, or back, surface. In addition, the figurines had tails that were also triangular in shape, but were vertical – again, unlike any living flying creature that we know. Just in front of these tails were small projections very like elevators, or tail stabilizers, on an aircraft. 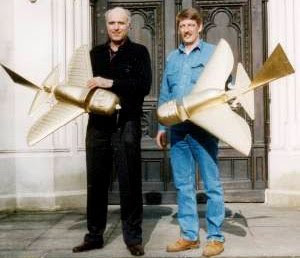 Again, the aeronautics engineers came in and made precise models, larger in scale, of several of the figurines and took them out to see if they flew. If they were catapulted into the air, the models would glide back to the earth at a 45 degree angle, much like NASA’s space shuttle. It is a form called a "lifting body," a very aerodyamically efficient shape, used in stealth bombers, F-117 stealth fighters and the B-1 bomber. If a motor was attached and the model given flaps and elevators and flown by radio control, it flew perfectly. There was no need for adjustments or modifications of any part of the shape. It was a fully operational aircraft design. 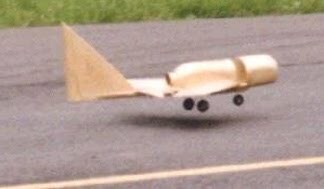 The only explanation would have to be that the makers of the gold figurines had seen a functioning aircraft in enough detail to replicate it’s shape. Not just once, but at least a dozen times, putting a fluke of chance completely out of the question. In addition, it should be noted that all of the figurines have wings that are either swept back (as opposed to sticking straight out from the fuselage at a 90 degree angle) or what is called a “delta wing.” A delta wing is a triangular shaped wing, which also has the front edge angled back toward the tail. In the development of aircraft, we only started using swept back forms of wings when we starting flying faster than the speed of sound. 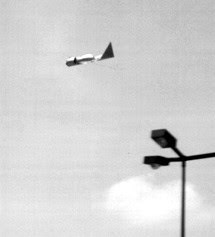 Swept back wings function better aerodynamically when you are flying faster than the speed of sound. Conclusion? These figurines had to be modeled on planes that were capable of supersonic speeds – let’s say, over 500 miles per hour. People have been studying the mysterious lines on the Nazca plains of Peru for decades. Only recently, however, with the advent of flight and the ability to see the lines from the air, could it be recognized that these lines formed enormous figures of all kinds of things – whales, birds, tarantulas, etc. The most interesting lines, though, are the ones that run completely straight – some as much as 17 miles long. To see these paired straight lines from the air immediately reminds you of an airstrip or, in some cases where multiple lines cross each other, an airport complex. 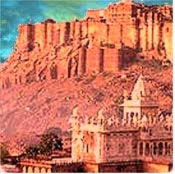 Some of them have been built on top of mountains. In order to make the flat surface necessary for these straight lines, the entire tops of mountains have been removed and made as flat as a parking lot. The interesting thing is that, as in the case of Derinkuyu, there is no sign of the rubble that had to have been removed. The surrounding peaks show how far the summit would have normally reached. It is obvious that a great deal of material had to have been removed – a huge amount, in the mega-tons. Where did all that rock go? There is no sign of it anywhere in the vicinity, near or far. ﻿﻿Within what is now Pakistan, lies the valley system of the Indus River, historically the eastern boundary of the entire Indian sub-continent. 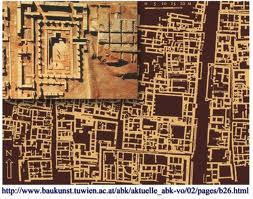 In 1922, researchers discovered the remains of an ancient culture buried in this area, creatively dubbed the Indus River civilization. 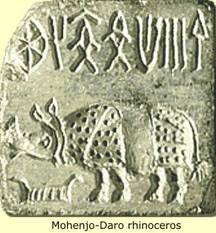 There were many communities, large and small, with three major cities - Mohenjo-Daro (a name which, charmingly enough, means Mound of the Dead), Harrapa and Kot Diji. Each of these cities (which have not been completely excavated) featured a modernistic grid city layout, an underground sewer system, advanced flood control of the nearby river with a large community reservoir, four story buildings and their own unique alphabet derived from the First Tongue alphabet (mentioned above). In every way, they seemed quite advanced, at a time when the politically correct archaeologists say that human kind was still largely a group of grunting cavemen. 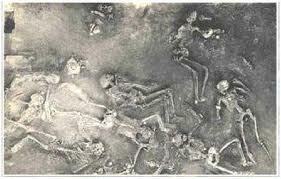 Horrifically, as excavations continued, 44 skeletons were found lying in the streets. There were many notable features about these skeletons. 1. There were none in the houses or buildings, only in the streets. 2. Some were holding hands. The patterns make one think that the inhabitants were all fleeing some danger that they all saw coming and were all struck down from behind with great force, killing a large number of them, but not all. 4. The bones were all perfectly articulated. That is, they were all arranged in the same way in relation to each other as when they died. This indicates that there was no scavenging by dogs, wolves, wild animals, etc. 5. None of the bones showed any sign of decay or decomposition – even after what is estimated to be 5,000 years. 6., They were all highly radioactive (50 times the normal level), even after all this time. Some researchers said that the only instance of higher readings being recorded in human beings were in the victims of Hiroshima. 7. The stones in the surrounding streets and buildings showed evidence of vitrification. This is a condition in which a stone is subjected to great heat and the surface is melted and hardens into a glass-like substance. To produce this effect in most stone requires exposure to heat of 5,500 to 9000 degrees Fahrenheit - only achievable by blast furnaces, currently. A heavy layer of radioactive ash in Rajasthan, India, covers a three-square mile area, ten miles west of Jodhpur. Scientists are investigating the site, where a housing development was being built. Radiation is still so intense, the area is highly dangerous. For some time it has been established that there is a very high rate of birth defects and cancer in the area under construction. The levels of radiation there have registered so high on investigators' gauges that the Indian government has now cordoned off the region. Scientists have unearthed an ancient city where evidence shows an atomic blast dating back thousands of years, from 8,000 to 12,000 years, destroyed most of the buildings and probably a half-million people. One researcher estimates that the nuclear bomb used was about the size of the ones dropped on Japan in 1945. Historian Kisari Mohan Ganguli says that "Indian sacred writings" are full of such descriptions, which sound like an atomic blast as experienced in Hiroshima and Nagasaki. He says references mention fighting sky chariots and final weapons. An ancient battle is described in the Drona Parva, a section of the Mahabharata. "It's so mind-boggling to imagine that some civilization had nuclear technology before we did. The radioactive ash adds credibility to the ancient Indian records that describe atomic warfare." In the northernmost reaches of Scotland lie a series of ancient stone forts whose origin and builders are long forgotten and untraceable. 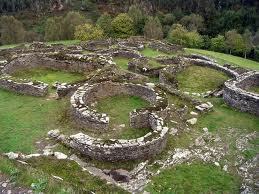 Each of these stone forts shows evidence of the aforementioned vitrification on their external stonework. Even odder is the fact that none of the surrounding rocky outcroppings, none of the associated ancient buildings nearby and none of the ground shows any evidence of this vitrification phenomenon. Only the forts show it. Archaeologists have tried to show how this was done by stacking loads of wood against the stonework and setting it on fire. Needless to say, this did not produce anything close to the same effect. In the southern reaches of the Nile lies the area that was called Nubia by the ancient Egyptians. 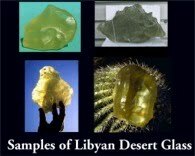 Within that former nation lie areas of what the ancient Egyptians called Nubian glass. These sheets of material stretch for large distances and are composed of varying thicknesses of a light green, glass-like material, very similar to modern glass. These stretches have been in existence since ancient times. This is attested to by the fact that Nubian glass was carved into jewelry and included in the tombs of the ancient Egyptians. 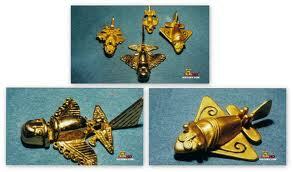 Some of it was even included in the fabled treasure of King Tut. Scientists were at a loss to explain what process produced this Nubian glass. 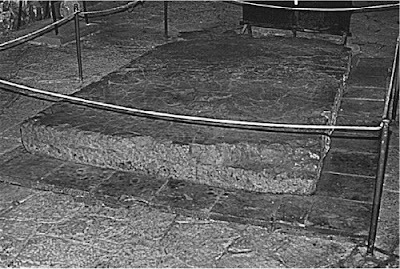 It was obvious that great heat had converted the top layer into a vitrified material, but there are no volcanic vents or evidences of eruptions anywhere nearby, so the process was a mystery. Until the first tests of the atomic bomb at Alamagordo were conducted. There, too, the top surface layer of the sand was converted by the heat into a glass-like substance. Wait, wait, wait! If we are guessing that nuclear weaponry dropped from airplanes is involved with these sites, there is a problem. You can’t just pick up some uranium rocks and fashion a bomb out of them. Before nuclear material can be suitable for weapons (or weapons grade), it has to be enriched first. That is, it must be passed through a nuclear reactor of some kind to make it more radioactive than it normally would be. In a place called Oklo, in the nation of Gabon on the African continent, while digging for uranium, prospectors started finding uranium that had been altered. It was a lower atomic number and there was plutonium present with it. None of that is possible without processing it through a breeder reactor. Thirteen sites were found where uranium and earth were used to produce breeder reactors, with water diverted from streams to dampen the reaction. Each is every bit as powerful and productive as any modern reactor. 1Jn 5:4 for everyone born of God overcomes the world. This is the victory that has overcome the world, even our faith. 1Jn 5:5 Who is it that overcomes the world? Only he who believes that Jesus is the Son of God. How merciful a God we have! Although we seemed determined to mess up over and over again in the same way, He still sent His Son to die for us. Doubt me, please! If you question what I am telling you, then good for you! Honest questioning is the path to wisdom and knowledge. Defensive, prejudiced, mocking questioning is, however, the sure path to fossilization of the mind and the soul. It will, like Lot’s wife, freeze us in longing for something that will destroy us. Question democratically, as Socrates did. Be sure that, in your questioning, you also give equal time to questioning the other things that you have been told by politically correct archaeologists and scientists. Be an honest researcher! You cannot depend on other people to be honest for you! You might want to read through the first entry post on this blog in order to understand the theoretical and theological underpinnings of this blog more clearly. This is a lot to take into consideration. Do you think that we will return to the original state or is our eternal life going to be something different all together? I think that the earth will be returned to it's original state, but that will be after we are raptured and given our glorified bodies. It will be succeeding generations that get to live in a pre-flood like environment.